The LoBoy deck box is simply the best cooler that money can buy. Have you ever come across one of those things that makes you wonder how you ever managed to get along without it? Remember how things used to be before cell phones? Remember encyclopedias? Remember how tough things were before electricity? Okay, maybe I'm getting just a little carried away. Or a lot. But this cypress wood LoBoy deck box really will revolutionize the way you think about keeping things cold (or hot) outside. Some manufacturers make a big deal about claiming their coolers will keep things cold for hours. Hours? How about days! 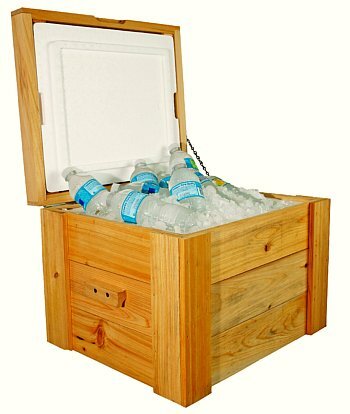 That's right - load up this LoBoy deck box cooler with ice and drinks on Thursday and you are good to go for the weekend. It works just as well keeping hot stuff hot. Simply put, these are the best coolers that money can buy when it comes to strength, durability, and heat or cold retention. Period. Combine the absolute best cooler, with unparalelled performance, and a beautiful all weather cypress deck box, and you have a unique and remarkable addition to your outdoor living area. 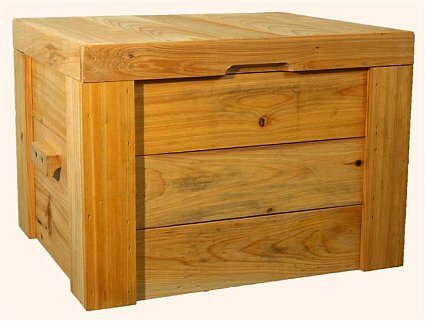 The LoBoy deck box can also serve as a table or a seat, depending on which model you choose. 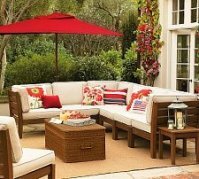 You may choose to apply stain or water treatment your deck box or you can leave it to weather naturally. The 68 quart model 103 with legsputs the top of the deck box at waist height - perfect right beside your grill. Use it as a preparation area or just take advantage of not having to bend over to get drinks or food. Add an implement rack and store your tongs, forks, sauce bottles or other accessories. 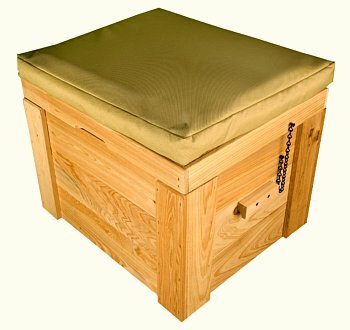 Or choose the 27 quart model 101 without legs, with the 2 inch cushion, and you have an extra seating area. 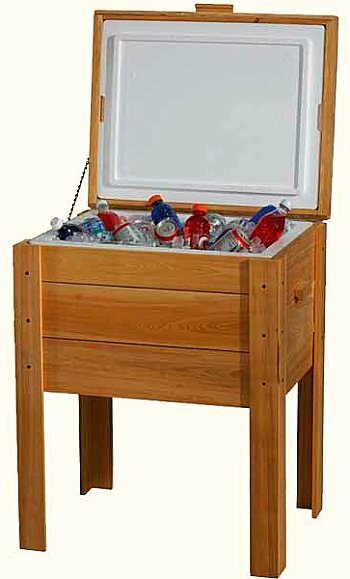 When you aren't using the cooler to keep drinks cold or food hot, it can be used for a convenient storage space. 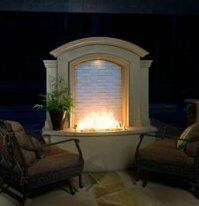 Keep towels ready for after swimming, or how about a couple of blankets for those cool nights out on the deck or patio? While loss of electricity isn't a regular occurance (hopefully), a LoBoy deck box is perfect for keeping refrigerated or frozen items safe for days. Regardless of how you use it, at the heart of the LoBoy deck box is the durable, efficient thickwall cooler, complete with drain. 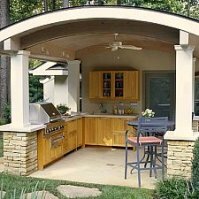 The cypress wood used to house the cooler is not only beautiful, but is naturally resistant to weather and insects. Clean up is a breeze with dish soap and water. Avoid petroleum based solvents as they will damage the cooler. Ready for one of your own? Go hereto get the best price - with free shipping! Or, if you really need to know the "nuts and bolts" about these great deck box coolers...read on! Well, you ask, what makes this cooler so special? How does it work so well for so long? It's pretty simple really. It all comes down to good old expanded polystyrene or EPS. As you know, I'm sure, EPS is a rigid closed cell plastic resin - a crude oil derivative. Pentane gas (or C5H12 as I like to call it) is used as a blowing agent. Polymerization occurs when the polystyrene resin granules are impregnated with the pentane gas. The actual production process begins when the beads are expanded to about 40 to 50 times their size. Those expanded beads are placed into an aluminum mold and heated until they fuse together. Cool it down and remove it from the mold...and viola! A high tech cooler that beats anything else out there! In short, this isn't your father's styrofoam cooler!